There seems to be a consensus of opinion that the place where the bodies of the SS Noss Head were washed ashore is Hangie Bay. 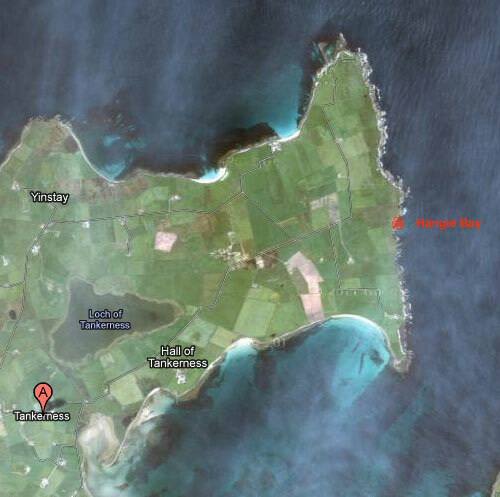 Hangie bay/geo is situated between Lea Taing and Rerwick Head in Tankerness. One of our readers has pointed out that tankerness and deerness are quite often mistaken for the same place! Bodies of 2 of the crewmen of the SS Noss Head which sank in 1941 were washed ashore in Orkney. The writing on one of the death certificates is difficult to understand and as our reader has already stated, Deerness has become mistaken with Tankerness, adding further confusion to the research. The ocean has a strong westerly current in this region, pushing anything in the waters towards the coastline. Many thanks for your help Collin.